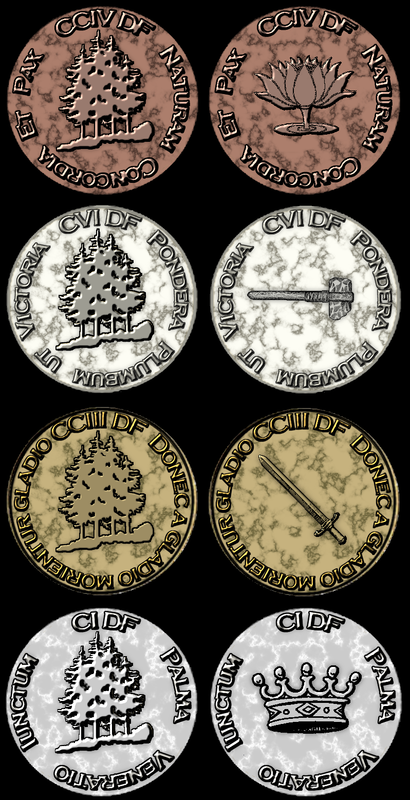 I decided to revisit the coins of the realm, and came up with a much more fitting design. It's evocative of Isolde-Delta, while also retaining the classic elements that made the original designs simple and effective. The marbling in the background was included to show the imprecise process of smelting, while dropping the Runic/Harn font design, in favor of an easier to identify Latin motif. Silver and platinum were contrasted against each other by incorporating a cream base in the silver, while the platinum retained a white base.